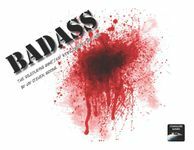 BADASS is not a game that you can attempt to work your way around with logic. In fact, BADASS kicks that logic in the face, twists its arm behind its back and makes it cry for its momma. Does it make sense? NO! Does it have to? HELL NO! In fact the moment you start making sense is the moment you lose your Badass Points, reverting into the mewling pathetic 98-pound weakling you truly are.